The clipboard viewer is a handy way to see exactly what's on your clipboard. Whenever you want to see exactly what's being stored in your clipboard run Free Clipboard Viewer. Most applications for Windows support cutting or copying data to the Windows Clipboard and pasting data from the Clipboard. The Clipboard data formats vary among applications. An application can place more than one object on the clipboard, each representing the same information in a different clipboard format. Free Clipboard Viewer lists the available formats for any data that is currently stored on the clipboard. Want to view what you have put on the Windows Clipboard? 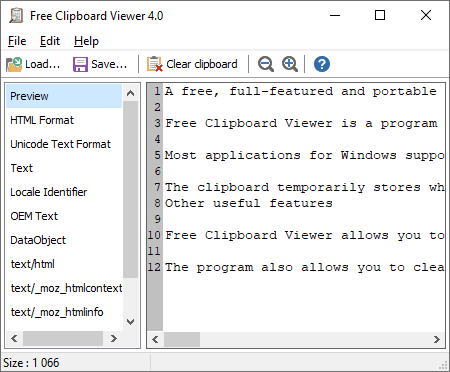 Free Clipboard Viewer shows you the information you have copied to the Clipboard. You can store information permanently to a file and share it with other users. Free Clipboard Viewer allows you to transfer clipboard between machines on the network. In order to clear the clipboard, open Free Clipboard Viewer and click on button "Delete". Free Clipboard Viewer is a totally portable application; bring your clipboard viewer with you from PC to PC.